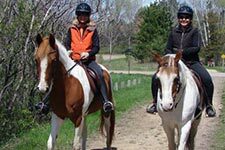 Minnesota's state parks and forests offer great places to ride, with over 1,000 miles of horse trails featuring all kinds of terrain. Don't forget to pack your horse pass! Riding on most DNR-administered land requires one. Want to go camping with your horse?